The Alamo Square neighborhood boasts the distinction of being a local favorite as well as one of the most visited tourist attractions. Snuggled in between the Western Addition, Hayes Valley, and North Panhandle neighborhoods, this residential and booming commercial district is full of hip nightclubs, celebrated restaurants, and some of the finest options in gourmet grocery shopping. The neighborhood is the proud home one of the most recognized San Francisco postcard views: the iconic Painted Ladies, a.k.a. Postcard Road. The term “Painted Ladies” has come to refer to all Victorian and Edwardian era buildings painted in three or more colors to enhance their architectural details. The tree-lined residential streets are populated with a diverse mix of residents from longtime homeowners and families to young professionals and students. The area is highly connected to the city’s public transportation system, and offers easy access to freeways and direct lines to downtown. While the park is the neighborhood’s focal point, the food is a major attraction. The district’s surge in foot traffic is in part a result of the local food-oriented powerhouses that have put roots down in the neighborhood. On Divisadero you can find Nopa, a restaurant boasting locally-sourced urban rustic cuisine and – just next door – gourmet grocer Bi-Rite Market, both renowned for big crowds that spill onto the sidewalks during peak hours. 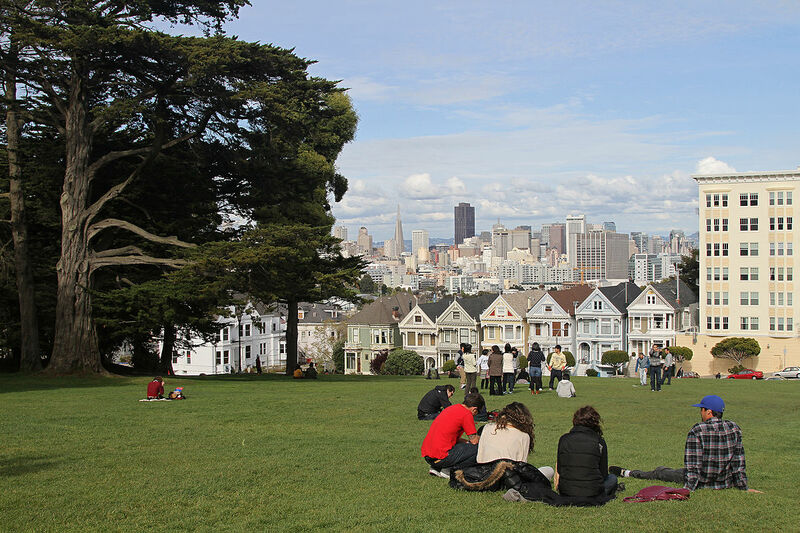 Alamo Square is a perfectly balanced neighborhood of residential options, shared green space and a healthy dose of boutique shopping, quirky cafes, destination nightclubs and music venues, and notable restaurants.